Pick up you FREE copy today! Your Sports and Recreation Resource! 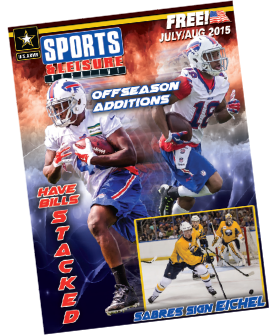 To get the low-down on the Bills, Sabres, local sports teams and recreation in the area, it's got to be Sports & Leisure Magazine! Check out our current issue features online and get a summary of what to expect in the FREE print edition at locations near you. If you need some catching up on past issues check out our previous issues were you can find a list of stories from the past and downloadable PDF's of issues. With the 2015 NHL Draft officially in the books, the Sabres walked out of Sunrise Florida as one of the clear winners of the weekend. click here for more . . .